Self care for moms became a big passion of mine when I found myself completely burnt out after working, taking care of a kid, taking care of a home and not taking care of myself. 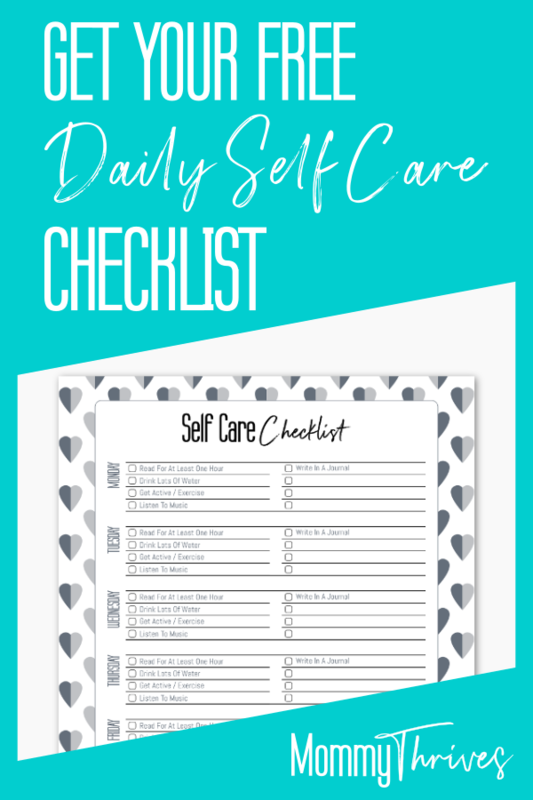 I put together this daily self care checklist so other moms can start taking care of themselves and be a better mom, wife, and start to feel human again too. Are you actively partaking in self care activities everyday? If you aren’t you need to. We spend so much of our time being busy, running errands, and doing for others that we forget to take care of ourselves too. The kids, work, and managing a home can cause extreme stress on a woman, we need to stop every now and then to make ourselves a priority. Today I want to show you 5 things you can do every day, that won’t take much time but will assist you in making yourself a priority too. These 5 things may seem super small at first but will lead to big overall changes. Before you know it you will feel healthier, be happier, and be getting even more popular self care activities in every single day. In case you don’t already know there are several reasons why you need to do self care activities every single day. Daily self care activities will help you to feel less stressed and more relaxed each and every day. You are freeing your mind and body from daily stress by making sure you are taking care of yourself. Getting active, eating healthy, getting enough sleep will all help your body to recover faster and feel healthier. Spending time reading, journaling, or being creative helps to relax your mind and let go of your mental stress. By releasing mental and physical stresses your mood will improve greatly. If you are getting enough sleep you are going to have less sleep related mood issues. If you are relaxing your brain and getting active you are releasing mental stresses while getting your blood pumping and releasing endorphins. This improves your overall mood. Taking time daily to focus on your physical needs helps you to be more focused and productive throughout the day. If you tired, holding tension, or have your mind cluttered with loads of different thoughts you will find yourself more distracted. This distracted feeling will harm your productivity levels. By taking time to deal with your mental or physical state it will be a lot easier to sit down and focus on the tasks you need to accomplish. Furthermore, you will be doing this with 100% attention and complete the task faster than if you didn’t partake in any self care at all. Creativity is not something you naturally have it’s something you want to have and continue working on to get more of. Creative people are natural problem solvers. Building your creativity skills allows you to think outside the box. This will help you with creating solutions to problems that cause stress or tension in your life. Now that you can see the benefits of daily self care I’m going to introduce you to the 5 daily habits that are simple to do but will improve your daily life immensely. I know there are a lot of people who wish they had more time to read every day but just feel like they don’t. I have a solution to you getting more reading time in. Do it before bed. Shut off the TV and read instead. It doesn’t matter if I read, watch TV, play games, or do nothing. It always takes me an hour or more to fall asleep anyways. Reading relaxes your mind by helping you to narrow down your focus to one thing. All of the days stresses and events just melt away out of your mind and you start to relax. Now I can read a book in just a few days even if all I’m doing is reading before bed. This means I am taking at least a few trips every month to the library. Not anymore. I highly recommend getting the Amazon Kindle Fire 7 Tablet with Kindle Unlimited. The Blue Shade feature makes it so that the tablet doesn’t hurt your eyes or impede with your melatonin levels while reading in a dark room at night. The Amazon Kindle Fire 7 is a fantastic device. Outside of all the regular tablet features like apps for social media and games, you have easy access to a library of hundreds of thousands of books. I have read 4 books in the past 2 weeks since getting Kindle Unlimited and I’m about to start book number 5. It’s an amazing program that allows you to read books for free and without driving to the library to do it. Plus because it’s on your tablet you can take it with easily without it taking up room in a purse or separate bag. This means you can get in some reading time during your lunch break, while you wait for kids to get out of school, at doctor’s offices, and anywhere you really want to. Done with a book, just get another one out right away without waiting or without checking your library first. Reading is an important part of daily self care for the mental benefits and the creativity factors. Make sure you get in this time every single day. You would be surprised what a well hydrated body feels like and how you may have gone so long without being well hydrated. Drinking more water is essential to our daily self care checklist for a numerous amount of reason. First, staying well hydrated helps to ward off headaches. Most headaches happen when the body is not hydrated. By drinking lots of water you are less likely to experience headaches. Second, drinking more water helps you to eat less. Seriously, if you are chugging back a 16 oz bottle of water almost every hour you are awake or before each meal you will eat less because you will feel more full. This means you will stop binge eating so much and actually go for healthier snacks throughout the day. Third, a well hydrated body can experience less pain. If your muscles are hydrated they will heal a lot faster than if your body is dehydrated. So if you experience aches and pains frequently more water in your daily life will help to reduce those pains. Finally, drinking water helps our bodies to perform better. Kidney and liver function are better when a body is getting enough water. You are also less likely to get kidney stones, bladder infections, or urinary tract infections it you are drinking enough water every day. By the way, when I say drink water I mean drink water. Not coffee, not tea, not fluids like water actual water. If you are lucky enough to live in an area that has decent city water get yourself some water bottles and refill them with water every day. I actually recommend getting the bottles of Voss water. The bottles are easy to wash and they even have the super large glass versions. As for how much water you should be drinking take your body weight and divide it in half. That’s how many ounces of water you should drink every day. For simple math, a 180 lbs person should drink 90 ounces of water every day. That’s a little under 6, 16 oz bottles of water. The next item on our daily self care checklist is getting active everyday. I’m not saying you have to workout for an hour or more everyday. You don’t even need to go to a gym. Getting active means moving or stretching your body. Turn on some music and dance around your kitchen or living room while you clean up everything. Run through a sun salutation yoga sequence. Do a 20 minute pilates routine. Even go for a nightly walk around your neighborhood. Activity helps to release endorphins which help to improve mood. Keeping your body active on a daily basis will also help it to get stronger. Aches and pains will disappear and you will probably notice a difference in your overall body as you continue with this daily routine. Getting active every day doesn’t mean you need a high intensity workout, it just means you need to move your body a bit more than you normally do for about 20 minutes each day. Music has been proven to help increase happiness, reduce stress, and relieve tension. Instead of watching the news in the morning turn on some music instead. Start your day off with a bit of hair brush singing and dancing in your bathroom. Now you are killing two birds with one stone by getting active in the morning and dancing around while you are getting ready. You are also starting your day off right by getting into a good mood before you even leave your house for work or errands. Music is a great way to improve focus while at work too. Turn on your Amazon Unlimited Music and listen to it while you are at your desk in order to give yourself some background noise. Additionally when a song you enjoy comes on it will also drastically improve your mood. The final thing to add to your daily self care checklist is journaling. Everyday you need to stop reflect a bit on your day and put it to a close. I usually do this just before bedtime every day. The act of journaling will help you to find things you are grateful for in the day, record progress on goals, and release frustrations or irritations. I personally use a bullet journal set up that allows me to do all of this plus track habits, mood, books read, and more. My bullet journal also helps me to get more creative everyday. The act of drawing, writing, and coloring really helps to improve my mood and release daily stress. This means I get a better nights sleep which is extremely beneficial to the body. I used to keep my daily self care checklist in my bullet journal but after so many month my checklist is now just daily habits that I continue. You can create a habit tracker for your daily self care checklist or you can set reminders in your phone. If you aren’t doing any of these daily habits I recommend starting off slow with just one or two of the daily habits. Then slowly add more till you get into the habit of doing all five. These five habits will help you to be more productive, improve your mood, and feel more relaxed each and every day. Remember taking care of yourself needs to be a priority in your everyday life. Which of these daily self care habits do you do every day? Let me know in the comments below. Follow me on Pinterest for more like this and pin this to your self care boards. As a work from home mom who struggles with anxiety I learned the importance of self care pretty quickly. Especially after one particularly stressful day when I realized I had suppressed so much stress and forgot to give myself a breather. I realized I needed to find self care ideas that I could do daily that would take less than 20 minutes. I went on a big search of self care ideas. Unfortunately a lot of the self care tips were things that as a work at home mom just aren’t feasible. I’m lucky if I get to shower without a knock on the door or banging and screaming from an overly clingy toddler. Let alone take a nice hot bath with wine and a book for an hour. So I needed 20 minute or less self care ideas that could be accomplished while Lucas slept. I wanted realistic self care ideas that are cheap or free. Going and getting my nails done, or a pedicure, or sitting in Starbucks are just not feasible for me like they used to be. They needed to help me relieve anxiety quickly. So I started thinking what are some of my favorite things to do? I came up with this list. Perfect for right before bed or even during nap time. Escape into a book and read for 20 minutes. If needed, set a timer on your phone so you know when your time is up. For 20 minutes you are in a completely different world. I love my Amazon Fire Tablet with my Kindle Unlimited program for this. The tablet fits nicely in my purse so I can get in some self care reading time anytime I want. Coloring for 20 minutes will drastically lower your stress levels. Those Adult Coloring Books are hot for a reason. As a former paint and sip host believe me I know how much getting creative actually reduces your stress levels. We all know nothing makes you happier than hearing the sweet sound of your child’s laughter. Go and make them laugh. Tickle, play, or cuddle and let all the worry and stress of the day just melt away. Plus your kid gets some extra special Mom or Dad time too. We all love to massage our own scalp. It feels good and helps to make your head feel fuzzy which is extremely relaxing. Added bonus scalp massages can help increase blood flow to the scalp making your hair grow faster and stronger. It is a widely known fact that people with pets are less stressed and healthier than those without. Take advantage of the anxiety reducing effects and curl up with Mr. Fuzzybutt for some quick self care. Spray your favorite scent on your pillow, lavender or vanilla maybe? Then just breathe in the scent. Scent can be a powerful tool in igniting certain emotions – so use that power to help relax for a few minutes. This is my all time favorite scent for relaxation. YouTube has some amazing guided meditation videos that could really benefit you. Pick out a few of your favorites and sit and relax for a few minutes. Meditation does nothing but slow you down, forces you to take your mind off your problems, and focus on breathing. I recently started using meditation nightly to help relax for a better nights sleep. This one is a new one but I find it to be the most powerful way to relieve stress immediately. Obviously please make sure your significant other gets a little joy out of being scared, if they laugh when you accidentally scare them like my husband does. Chances are you are good. A few days ago after waking my husband I hid and waited for him to come walking down the hallway. I jumped out and said Boo! He jumped and we both laughed for a good 5 minutes. It was a huge stress relief and actually started off our day on an awesome footing. Turn on a playlist and just dance in your living room or bedroom. It increases your heart rate and gets your blood flowing which helps to boost endorphins. It also gives you enough time to break from your daily stress and reduce it. Go for a walk. Around your neighborhood, to the store, anywhere. Just get out of your house or workplace and go walk. Walking is fantastic exercise which helps to produce endorphins while giving you alone time which is fantastic self care. I do this one any evening I can. Living in Ohio means I don’t always get sunny days but when we do I soak up as much sun as I can. Vitamin D is crucial to battle feelings of anxiety or depression. I’m lucky on this one, I blog therefore I write about 3 times a week. However, it takes me a lot longer than 20 minutes to write my posts. What I actually mean about writing as a 20 minute self care is keep a journal or diary where you can write it out. Get all your thoughts out in a stream of consciousness. It will help to cure some of the scatter brain feeling we all get at times. You can also try starting a bullet journal. Starting mine was a fantastic decision. I rarely forget things and I have a great place to journal too. I do not care if you have a horrible singing voice. Jump into your car turn on the stereo and sing it out. No one will hear you but for 5 minutes it’s you and your song. Nothing helps you make it through a tough day quite like singing your current anthem. Go into your bathroom slather on your favorite mask. Sit and let it dry for 15-20 minutes. It’s like getting a mini spa day without spending a bunch of money. Even in you have oily hair deep conditioning your hair is important for strong hair. Massaging your scalp while applying the conditioner, sitting while it soaks in, and the soft feel afterwards are all very relaxing. No joke right after your shower just slather lotion all over your body. Massaging lotion will help to relieve muscle tension but using your favorite scent can help to relax you as well. I use this one when I need to de-stress. I love to just stand in the shower and let the hot water run over my head. It drowns out much of the noise in a toddler house. The heat helps to relax muscles. This is one of my favorite self care ideas. Ok obviously I’m not saying you should drown your emotions in food. We all know that sugar triggers the happiness hormone in your brain which is why we have such a sugar problem. What I’m saying is eat some watermelon or chocolate covered strawberries. Have that bowl (or pint) of ice cream. Just give in to the sugary temptation every once in awhile. Also, you aren’t allowed to feel bad about it either. If you really don’t want to blow your diet try one of these smoothies instead. Sometimes all you need to do is take five minutes to just breathe. Five minutes to just sit in silence and count out your breathing. This clears your mind and allows better oxygen flow into your brain relieving some of the tension or stress. I love this one. Seriously get down on the floor and spread out. Stretch your arms above your head, point your toes, and act like you are physically being pulled in opposite directions. Once the stretch is complete you will feel a bit more relaxed so lay there for a few minutes enjoying the tingling. Self care should be a priority in your life. It gives you a bit more relaxation and helps to improve mood. Self care can help to improve relationships with those you are closest too while also allowing you to naturally relieve stress and anxiety. Do you have any self care ideas? If so please comment. Follow me on Pinterest and pin this. Share it with friends who could benefit from self care.